Investors in the Philippines are among Asia's most optimistic and most outward-looking, given their willingness to invest outside the Philippines to gain returns, according to the latest Manulife Investor Sentiment Index* covering the second quarter of 2014. Philippines investors reach across emerging Asia to mature markets. 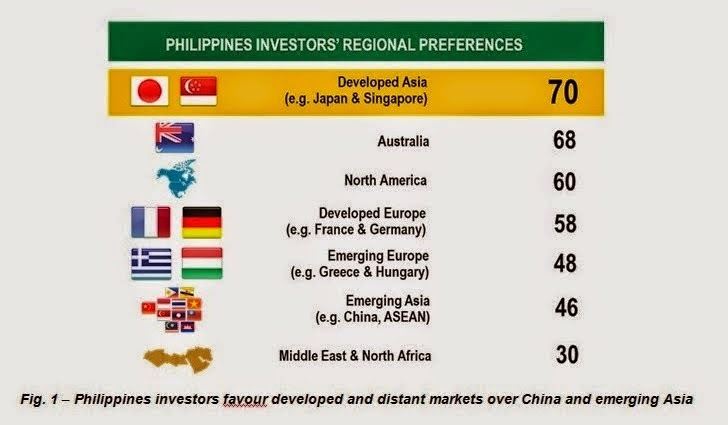 When asked which region they think is best to invest in, Philippines investors point to developed Asia, Australasia and North America over emerging markets, including emerging Asia and the Middle East and North Africa. Philippines investors seem less affected by home-market bias than any other investors in the survey. Given a selection of single markets, they show most enthusiasm for Canada (76 points) and Japan (73) above the Philippines itself (51), and show least for China (44), which most other Asia investors rank relatively higher. 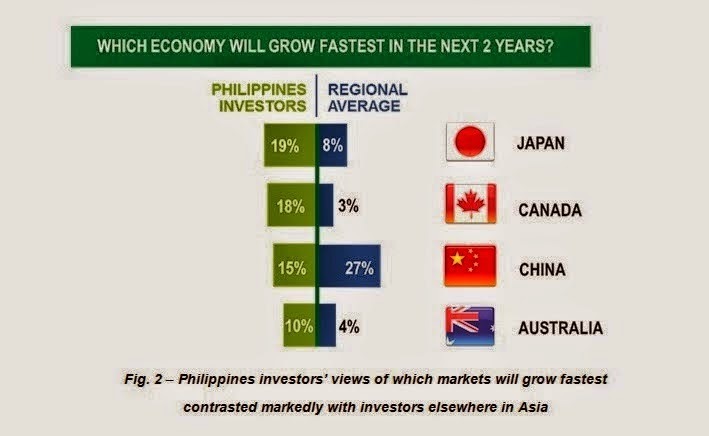 When it comes to growth, Philippines investors are also most optimistic about Japan and Canada, with 19 percent believing that Japan’s economy will be the fastest growing in the next two years, followed by Canada, China and Australia. This contrasts markedly with the average Asia investor, 27 percent of whom expect China’s economy to grow fastest, followed by much lower expectations for Japan Australia and Canada. "Our research suggests that Philippines investors’ preference for Japan is likely related to Japan’s first quarter GDP growth which came in at 6.7 percent on strong consumer demand ahead of the implementation of a new goods and services tax," said Aira Gaspar, CFA, Chief Investment Officer of Manulife Philippines. “It's also interesting that Philippines investors seem so keen on Canada. We think there is a sound basis for this given that Canadian equities outperformed their developed market peers in the first quarter." Despite their international outlook, Philippines investors place their faith closer to home when it comes to making investment decisions, with 88 percent relying on or referring to family, friends or colleagues as a source of advice – the highest level in the region and well above the regional average of 58 percent. They are less dependent on industry staff, mass media or online sources of investment advice. Philippines investors also have a very ‘bricks and mortar’ approach to portfolio composition, with 61 percent saying they own investment property (against the Asian average of 19 percent) and 75 percent owning their own home (against an Asian average of 50 percent). Cash and property together make up the bulk of their portfolios. Conversely, they have much lower ownership of stocks (15 percent versus the Asian average of 48 percent) and mutual funds (6 percent versus 23 percent) – even though their sentiment towards equities is the highest in Asia. In addition to their positive views about investing overseas, Philippines investors remain optimistic about investing at home with the sentiment index for domestic investment at 59, the highest in Asia. This optimism was spread across all asset classes in the survey, which all saw increases except cash. Fixed income saw the biggest increase, up 5 points to 50; followed by stocks, up 4 to 45. Mutual funds rose 1 point to 36. Property has taken the lead as the most favored asset class, with home property highest at 75, up 1 in the quarter, while investment property rose by 4 points to 74. Cash was the only asset class to see a decline, down 9 to 73, but still remains high. For more findings and related information from the Manulife Investor Sentiment Index in Asia, please visit www.manulife-asia.com.